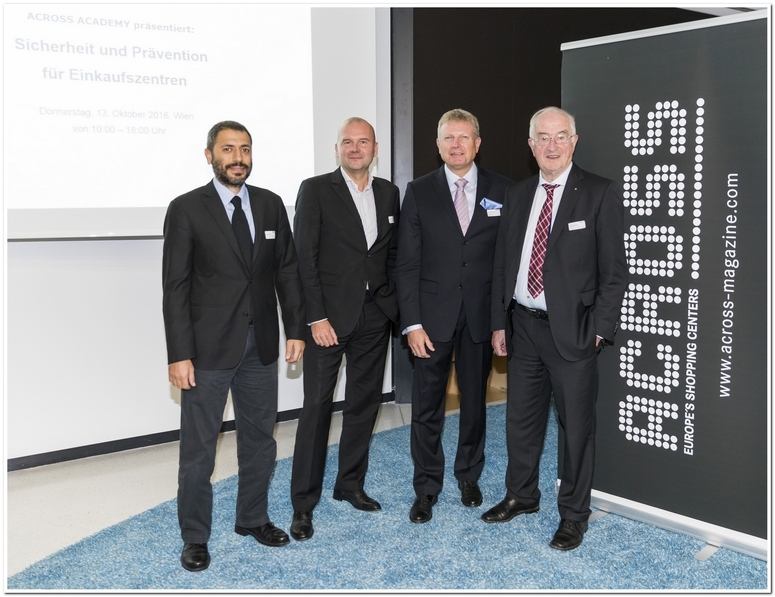 The latest seminar of the ACROSS ACADEMY took place in Vienna on October 13, 2016 and focused on the highly charged issue of security in shopping centers. The three security experts Rolf Tophoven, Uwe Gerstenberg, and Melih Niyego gave speeches at this event. Rolf Tophoven provided an impressive overview of the international security situation as well as valuable insights into the structures and behavior patterns of terrorist organizations. Uwe Gerstenberg continued with a very practice oriented overview of risk potentials for shopping centers. His speech also included a comprehensive and detailed presentation about the structures of security concepts. One of the seminar’s particular highlights was Melih Niyego’s best-practice presentation. His company is responsible for the security of more than 40 shopping centers in Turkey. His speech impressed with a lot of practical know-how, spectacular videos, and valuable insights from the Turkish market. The high-profile audience (from Germany, Austria, and Switzerland) was impressed and took home highly valuable ideas for practical implementations. Further ACROSS ACADEMY seminars will be announced shortly.